I never thought I'd jump on the 'Boyfriend' jeans bandwagon, especially since my bottom half is more of the bootilicious variety compared to my top half. I actually dislike jeans shopping with a passion. Trying on so many pairs that either fit on the waist, but are too tight on the calves or vice versa, baggy on the bum, too long, too short, makes me look stumpy, gapes at the back and the list goes on! However I took a punch and got a pleasant surprise with this pair of 'Boyfriend' capris that I picked up in Gap Tokyo. 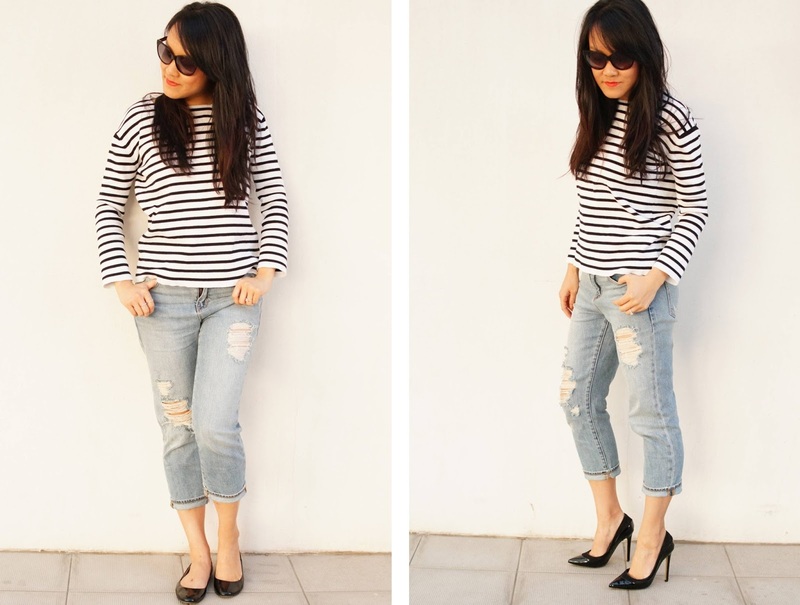 'Boyfriend' jeans aren't for everyone, and I know they look super duper cool on tall skinny long legged girls, but what I'm loving the most is the comfort factor, and the ability to dress them up or down with flats or heels. 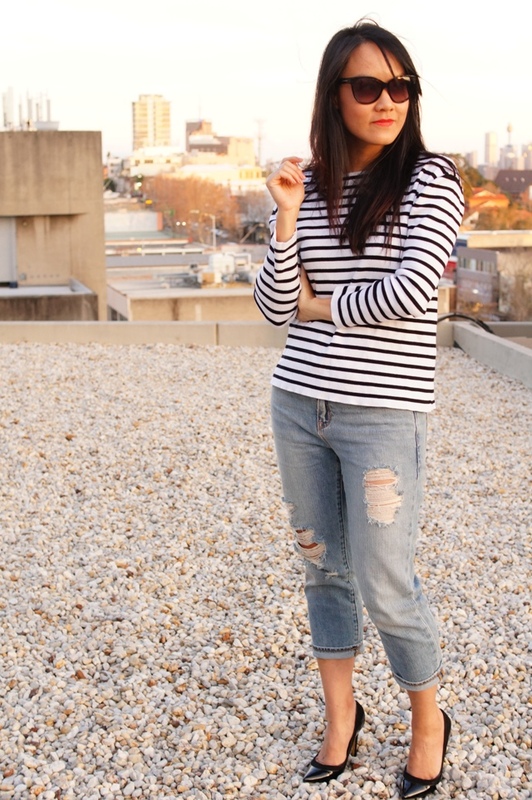 This is just a simple outfit put together with a stripe jersey knit, a red lip with no other accessories except for a couple of different shoes. If your top half is a different size to your bottom half, play it up with stripes! 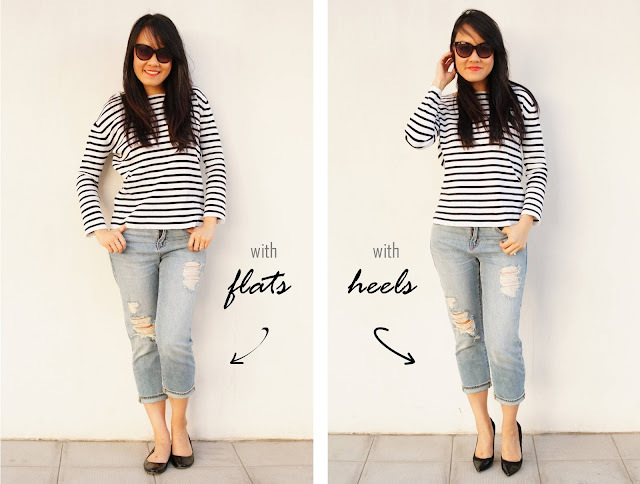 Horizontal stripes give the illusion of width and since my bottom half is larger than my top, pulling a stripe top was the easy way to play with proportions. The crotch isn't too 'dropped' on this pair, and except for the fact that I keep putting my foot through the rips when I put them on (I'm almost always in a rush! ), I think they fit like a glove. It's my first time venturing into the ripped variety too! Maybe I should have bought a second pair as a backup because I'm currently living in these! they look great on you - and ps you're HARDLY bootilicious!! Food & Fashion - Pops of Pink!